Has your dog been sprayed by a skunk? Even if you have never faced this problem, it's helpful to know how to handle it just in case. Contrary to popular belief, the solution to this problem is not tomato juice or vinegar. Those do not remove the odor, only cover up the stench. Instead, create a homemade skunk bath with household items that will truly get rid of the nasty odor. This homemade solution is designed to break up the oils in skunk spray that cause the awful smell and neutralize the odor at the same time. The solution can also be used to remove skunk odor from clothing and other fabrics. It may have a mild bleaching effect on some materials. In addition, your dog's coat may become slightly lighter as a result of contact with the solution. If this happens, the effect should resolve itself over time. Don't worry, your black dog will not become a platinum blonde! Before attempting to remove the skunk odor, you must make sure that your dog is not injured. Put on some rubber or latex gloves and old clothes and look the dog over for bites or scratches. Check the eyes for redness or discharge. If any injuries are suspected, contact your veterinarian before proceeding. Most of the things you'll need to de-skunk your dog are already right in your kitchen or laundry supplies. Do not use higher concentrations of hydrogen peroxide or substitute baking soda with similar products (e.g., baking powder or washing powder). The altered chemical reaction could cause severe injury to you and your dog. Do not soak your dog with water prior to bathing. This will only make things worse. Time is of the essence here. The longer you wait to begin the process, the harder it will be to remove the stench. Get set up for bathing your dog outdoors or in an easy-to-clean area of your home, such as a laundry room or bathroom. If you're indoors, open a window to air out the area while you're working. Dab your dog's coat with dry paper towels in the sprayed areas to absorb any excess oil on the coat. Apply a small strip of eye lubricant, such as Puralube or 1 to 2 drops of mineral oil to your dog's eyes. This will help protect the eyes in case any of the solution splashes or drips in them. In a plastic container, combine 1 quart of hydrogen peroxide, 1/4 cup baking soda, and 1 to 2 teaspoons of liquid soap. Add lukewarm water if needed for larger dogs. Mix the ingredients well. A chemical reaction will occur and the solution will start to fizz. Use it immediately as the effectiveness will decline rapidly. Do not store this mixture or place the solution in a closed container or spray bottle. The pressure will build up and the container could burst. This could cause serious injury to you and your dog. Promptly begin cleansing the affected areas thoroughly, massaging the solution deep into your dog's coat to break up the oils from the skunk spray. You may wish to use a sponge or washcloth. Avoid getting the solution in your dog's eyes, ears, or mouth (or your own). Allow the solution to remain on your dog for at least five minutes, or longer if the strong odor persists. Keep your dog from licking any of this solution! Rinse your dog well with lukewarm water. Repeat the wash with fresh batches of the solution as needed until the odor is gone. Dry your dog well and reward it with a treat. 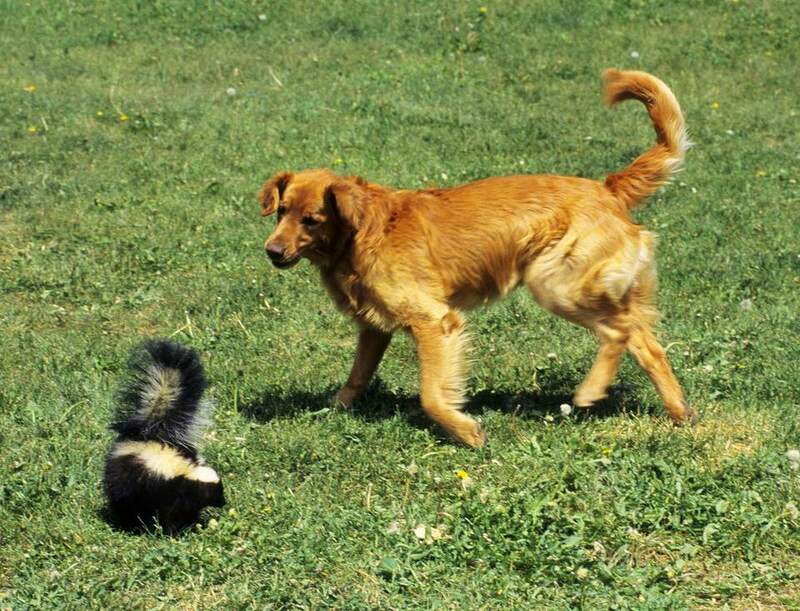 To help your dog avoid future run-ins with skunks, try to prevent attracting skunks onto your property. Do not leave food outside (even birdseed and fallen fruit from trees). Make sure garbage bins and garbage can lids are secured. Placing mothballs and ammonia-soaked rags around your property might deter skunks from approaching. Keep them out of your dog's reach. If your dog is regularly in situations where they might come in contact with skunks, a bottle of Nature's Miracle Skunk Odor Remover on standby is helpful. What Happens to Your Dog if You Die or Get Sick?